PHILIP MALONE was born on February 5, 1950. He became a member of the Marines while in Alexandria, Virginia and attained the rank of Private First Class. 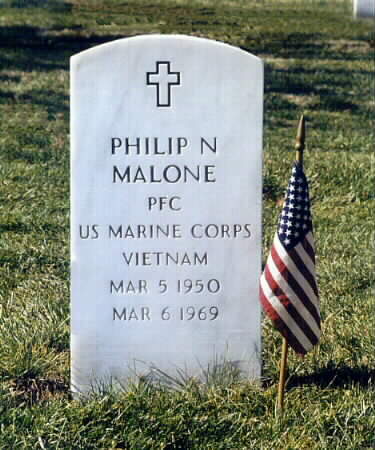 On March 6, 1969 at the age of 19, PHILIP MALONE gave his life in the service of our country in South Vietnam, Quang Nam Province. 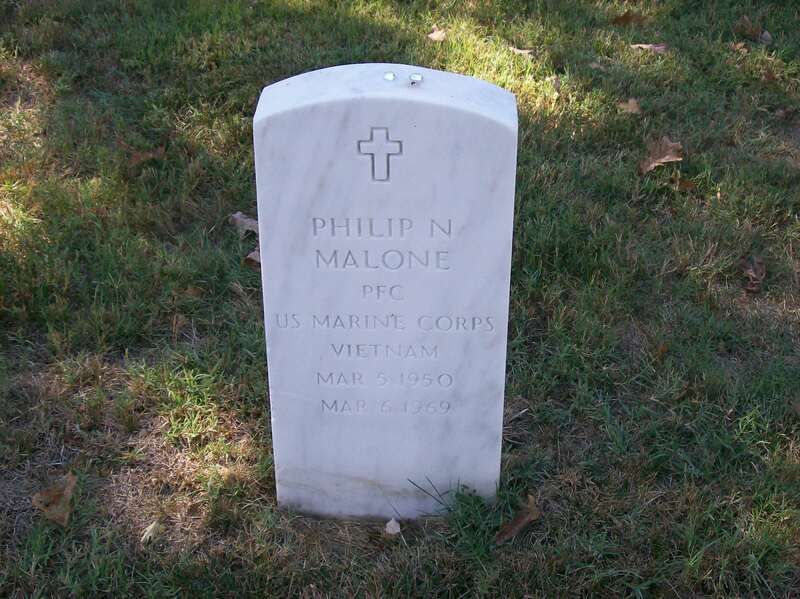 You can find PHILIP MALONE honored on the Vietnam Memorial Wall on Panel 30W, Row 57. 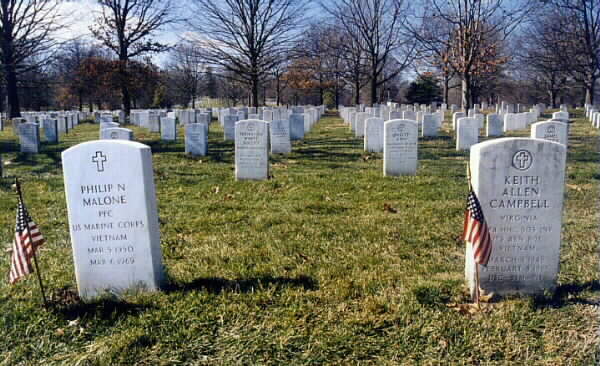 He is buried in Arlington National Cemetery next to a boyhood friend, Keith Allen Campbell. Buried next to Keith is Philip Newman Malone (Phil and I use to date). Phil was killed in Vietnam. I have lost track of his Mom and often wonder about her. 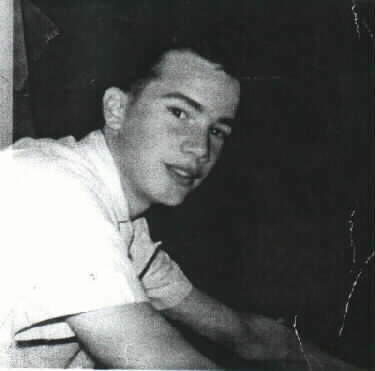 Marine Private First Class Philip Newman Malone, 19, an Arlington resident for about 12 years, was killed in Action on March 6, 1969 while on a night patrol near An Hoa in Quang Nam Province, Vietnam. 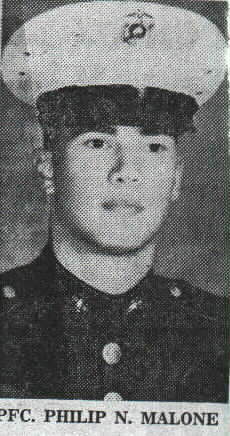 A native of Albany, New York, he attended Swanson Junior High School and was a senior at Washington-Lee High School in Arlington when he enlisted in the Marine Corps in December 1967. 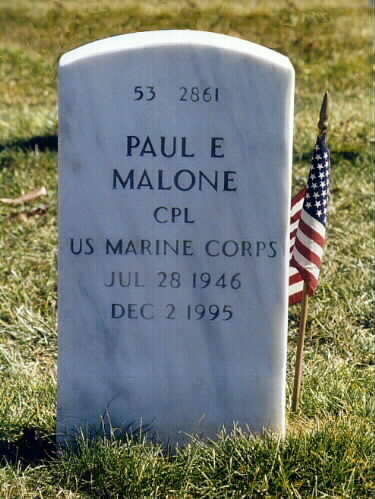 Private Malone was a combat communicator with the 5th Regiment, 1st Marine Division. He leaves his parents, Mrs. Jean N. Malone of Arlington, and Eugene J. Malone of Bancock, Thailand; two brothers, Paul and Michael; and his grandparents, Mrs. Gertrude Newman and Eugene J. Malone both of Albany. Friends may call from 3 to 8 p.m. tomorrow at the Robert J. Murphy Funeral Home in Arlington. Services will he at 8:45 a.m. Wednesday at the Fort Myer Chapel, with burial in Arlington National Cemetery. NOTE: His step-mother, Lina "Paddy" Malone, died in January 2003 and will be laid to rest in Arlington National Cemetery.